Wheeler Lake, Alabama’s second largest man made impoundment on the Tennessee River System in north Alabama, is situated just downstream of Guntersville Lake, the largest man made impoundment in Alabama. Both of these lakes on the Tennessee River System get a lot of attention from anglers coming here this fall in search of trophy bass. 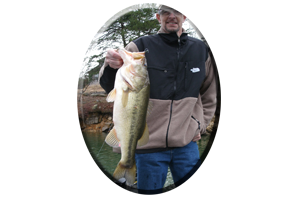 Wheeler Lake has a very good population of smallmouth bass, largemouth bass and striped bass. The cooler it gets the better the fishing gets on Wheeler Lake. Fall shows some major changes on this lake. Summer drought showed Wheeler down a few feet. It is now down 1 foot. Within a few weeks it could suddenly drop 3-4 feet. Even lower at times. Even your most well laid game plan can fall apart when your catching bass and then return a few weeks later and the water is gone in the shallows, places that you were “tearing them up” in and now the bass are gone as well. So when practicing for an upcoming tournament in October and November keep in mind those weeds and wood cover you were catching bass around, may be high and dry when you return, with the lake traditionally down for winter pool by the end of October. Not only are falling lake levels to be expected on Wheeler Lake this fall but falling water temperatures as well. Summer showed weekly air temperatures of over 100 degrees during late August. Water temperatures were close to 90 degrees for an entire month. Since then it has taken an entire month for the waters to cool back to normal water temperatures of around 80 degrees in late September. As with every year, it gets colder each month as the year comes to an end. October shows slight cold fronts invade north Alabama. By November cold fronts are common some bringing nighttime temperatures down below 30 degrees. Water temperatures that suddenly drop into the low 70′s trigger these bass to feed. It has not been that cool since spring when they were bedding and now they instinctively know winter is on its way. That means feeding and fattening up for the cold winter months ahead. It also means they are susceptible to whole a range of lures fishing from top to bottom. 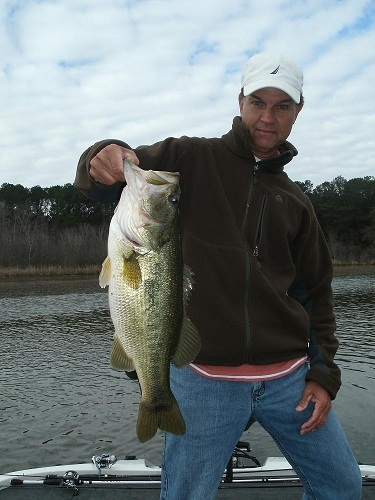 Topwater lures like buzzbaits, prop baits, popping type topwaters are all good in October and November on Wheeler Lake. Mid running lures like shallow running crankbaits and mid running crankbaits, lipless lures, floating and suspending jerkbaits and spinnerbaits. 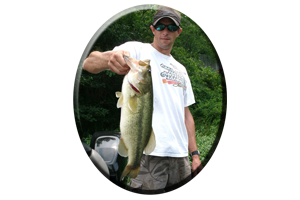 Floating worms and soft jerkbaits are very good in shallow water around wood and rock cover. Deeper water calls for lures fished on or near bottom and this can be many lure choices. Deep diving crankbaits and jigging spoons are good along drop-offs, ledges and along the sides of points. 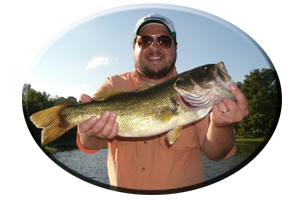 When bass are found, slow down and re work the area with Texas rigged worms, lizards and tube baits. Or try Carolina rigged plastics, creature type lures or jig combos, drop shot rigs and shad imitations on jig heads. All of these lure choices are good both in deep water and along shallow water drops this fall season and early winter. Another problem with the coming of the fall season is rain. The Tennessee River lakes can get a whole lot of rain run-off from upstream and at times it can get downright muddy water in the lakes headwaters, incoming feeder creeks and the incoming Elk River on the lakes lower end. So like when preparing for dropping lake levels an angler should be prepared for muddy water rain run-off and time the trip accordingly. If there has been days and days of heavy rain then expect some places to display stained to muddy water for a few days. 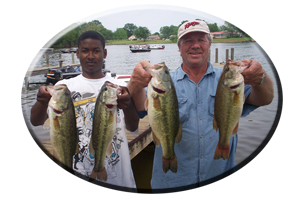 If faced with this muddy water problem no matter where you fish, find the clearest water available then fish bass attracting lures like noisy clacker type buzzbaits, half ounce spinnerbaits with over sized blades and bright, gaudy colors on the skirt and trailer. Try half ounce Rattletraps, Cotton Cordell’s Rattlin’ Spots and other lipless lures in colors of lime, chartreuse, red, orange and other crayfish colors. Visiting Wheeler lake this fall season? Or any Alabama lake? Always call on Reeds Guide Service…first! 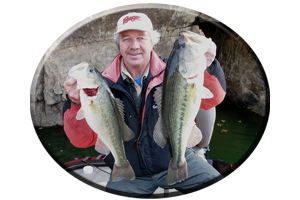 “Over 40 years fishing the Tennessee River lakes and other Alabama lakes”. Remember, a guided fishing trip with Reeds Guide Service (205) 663-1504 makes a great surprise gift for Birthday’s, Father’s Day and Christmas (certificates available), for those loved ones that love to fish. Several guides and boats available for multiple parties and corporate guided trips to any lake in Alabama, year round. See my website www.fishingalabama.com for more info.